Rates listed above are per person per night sharing based on 4 guests sharing. Children 0 - 2 years will be accommodated free of charge. Children 3 - 12 years will be accommodated on special discounted rates, please enquire with your Bushscapes consultant. On those chilly winter evenings, there’s little better than coming back to your room and the warmth generated by the lovely closed fire-places in the suites! 10 new luxurious free standing Luxury Suites built on the open plain overlooking their own private waterhole have succeeded in providing real style and luxury whilst still retaining excellent value pricing! Cheetah Ridge has undergone a massive transformation in recent times – in more ways than one. For one thing the name of the lodge has changed – this was originally known as Woodlands Lodge and consisted of a double-storey sprawling colonial grey stone manor house dating back to 1945. But the more significant change is undoubtedly the construction of 10 luxurious and very contemporary new Luxury Suites which have completely changed the entire feel of the lodge! The old manor house remains and still offers accommodation aimed especially at families – there are 2 very comfortable individual suites here which, although they can be booked separately, are ideally suited to a small family group. It’s located within a lush fenced-in garden, so kids can roam around safely, and also offers both a tennis court and swimming pool. But it’s the 10 new luxurious free standing Luxury Suites built on the open plain overlooking their own private waterhole that have got us really excited – they have succeeded in injecting some real style and luxury into the lodge whilst still retaining excellent value pricing! These Suites boast floor to ceiling glazing so you can literally lie on your bed whilst watching animals drinking at the waterhole. Another huge attraction are the beautiful stand-alone baths which have been placed right at the front of the room, so again you can enjoy stunning views whilst soaking in the tub! The rooms are a great mic of modern with traditional touches – so you get Nespresso machines, air-conditioning and lovely stylish closed fire-places (because this area can get both freezing cold as well as boiling hot!) combined with traditional reeded ceilings both inside the room as well as shading the outside deck (complete with a really comfy hanging chair). Perhaps the only real negative is that the rooms look a little stark scattered on the open grassy plain as there is no real vegetation to soften things and provide privacy – having said that, privacy screens on each rooms deck do ensure that your privacy is not going to be disturbed. The old manor house remains the central area where guests gather, eat, drink and socialise. Built back in 1945, the décor has been given a revamp and shows some lovely fresh and modern touches. The highlight though probably has to be eating under the spectacular old fig tree next to the house – why not enjoy a decadent high tea whilst seated on the beautiful wooden deck under this stunning tree. There’s also an atmospheric boma area for dining out under the stars – and if the weather doesn’t play ball there’s also an elegant dining room back in the manor house, after which there’s nothing better than to head to the cosy bar for an after-dinner port! By the way, one thing that guests regularly rave about is the genuine warmth and friendliness of the whole team at the lodge. Nambiti is steadily building a reputation for the quality of its game viewing experience. The reserve’s landscapes are both beautiful and scenically diverse – including vast open grassy plains, bushveld covered hills as well as a spectacular river valley complete with waterfalls. And the fact that it lies just 4 hours from Johannesburg and 3 hours from Durban along the N3 makes it one of the most accessible reserves in the country! 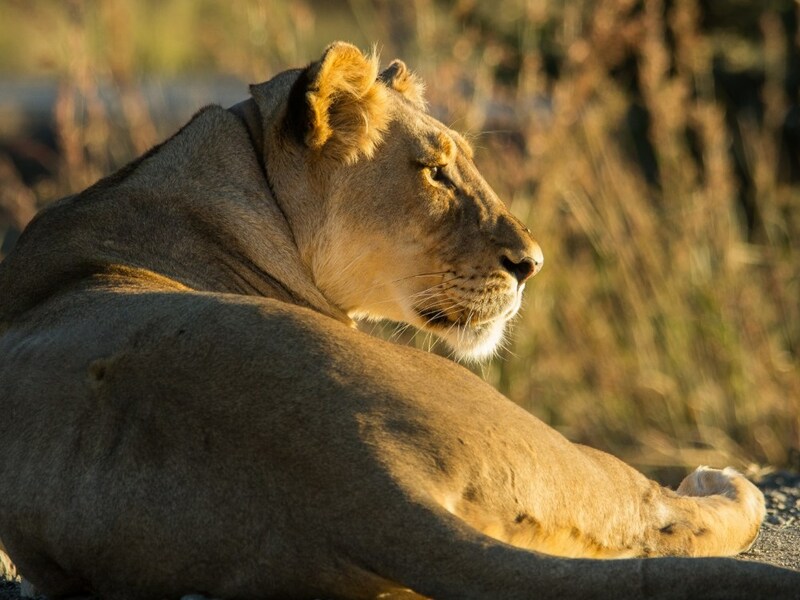 You’ll head out on safari every morning and afternoon/evening in open game-drive vehicles, traversing the valleys, grassy plains and African bushveld to bring you close to the Big 5 and other game which roams freely through the reserve! 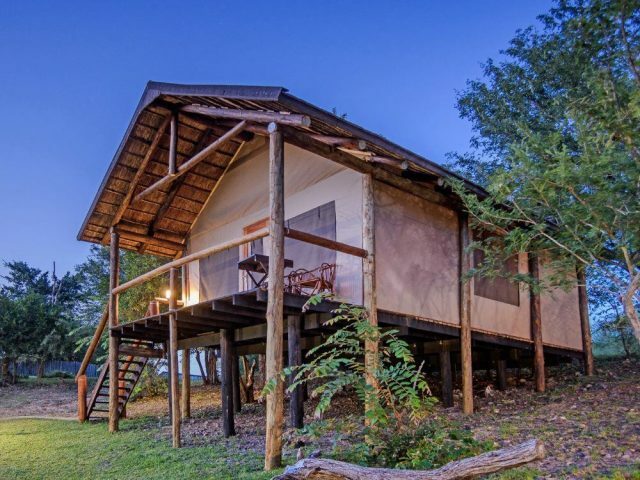 A Rhino Conservation Levy of R50 per person per night is to be settled at the lodge direct – (subject to change without prior notice). Children aged 0 - 2 years will stay free of charge when sharing with two full paying adults. Children aged 3 - 12 years will receive special discounted rates. Please kindly request an applicable rate from your Bushscapes consultant. Children under 2 years under are not permitted on game drives. Children aged 3 years and older will be permitted on game drives at the lodge management and rangers discretion.